Salary certificates are used in the worlds of business and finance to certify a person’s total income. Banks, for example, often request a salary certificate from the employer of a person seeking a home or personal loan. Whether you’re a small business owner or a human resources professional, having an easy-to-administer salary certificate template can help you finish this task quickly. Generally, a human resources professional is responsible for creating employee salary certificates within your company. Salary information is often kept private, so you may not want to ask your immediate supervisor or even division lead to create this type of documentation. If you work in a small business with no human resources department, the owner would be responsible for this task. Placing the provided template on company letterhead offers an efficient method of completing this type of documentation. Finding a New Job – When you enter a new job market, it may be helpful to have a salary certificate that lists your salary requirement, information about your gross total income, residence visa information, and more. Salary documentation is often dated, and is only valid for a single financial year. Having all of your basic salary information together on a certificate is one way to maintain continuity of information throughout your career. Anytime you start or end a position, you can request a salary certificate to keep on file. Salary letters are sometimes use as negotiation tools between the previous and new employers. If you are entering a new position and trying to negotiate a better salary than what is being offered, a salary certificate can be used to verify your previous salary. This can help you improve on the on the minimum salary for the position, or to negotiate better perks. Getting a Loan – Requesting money from a bank or other financial institution requires significant amounts of highly detailed paperwork. Lenders want to know that you will be able to pay back the money they loan, and may have salary requirements for loans of certain amounts or kinds. Many lenders will require a salary certificate or send a salary request letter to your employer’s human resources department to get this information. Promotions and Raises – While in most cases you don’t want salary information to become public, there are times when it is appropriate. More and more often, organizations are making the decision to be open about their salary. According to Sue Shellenbarger with The Wall Street Journal, companies such as Buffer, Whole Foods Market and more are choosing to post salary information either internally or even on their customer-facing website. The presentation of a salary certificate form at a company event when an employee achieves a promotion or receives a raise provides a visible token of accomplishment for all levels of employment, from mail room clerks to executive officers. Public Service – Whether you are operating a charitable service or running for re-election, a salary certificate can show your donors or your voters that your gross total income is modest or within the industry standard. From the owner of a small food bank to prime ministers and presidents, using salary certificates in this way can help alleviate any fears of corruption. 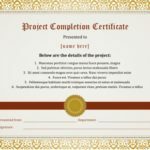 Below you will find several professionally designed salary certificate templates. Choose the format that is right for you, and download the template today. Keep it in your documents folder and you will be ready the next time an employee needs the information, or the next time you need to request it from your employer. The templates are all designed for your convenience, so you can quickly download the template and edit the details in Microsoft Word. 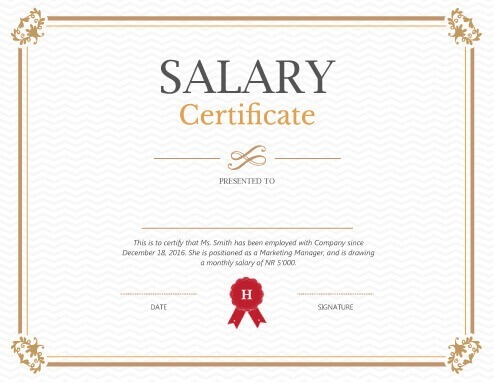 This basic salary certificate letter features a visually pleasing, spare design. A simple border and neutral colors make this an excellent, versatile choice for school districts or HR departments. Spaces are included for name of employee, date, and signature. A red seal motif at the bottom can be customized with a business initial. 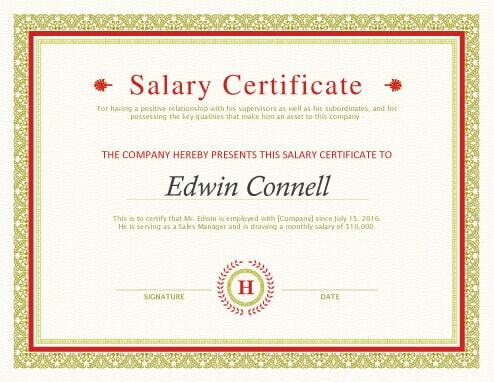 This fancy salary certificate sample makes a recent employment certification or new job role feel even more special. A neutral-colored border features a filigree design in each corner, and space is provided for employee name and signature in the center. Use this brightly colored salary certificate format to certify monthly salary, average salary, or net salary. Space at the top allows a description of why the certificate letter is being presented. Below the employee’s name, salary details can be given. Between the signature and date lines is a seal with space for the company’s initial.